Men due to appear in court over the incident in Dundee's Perth Road on Sunday. Three men have been arrested after armed police stopped a vehicle in Dundee. The trio were held by specialist officers on Perth Road around 6.30pm on Sunday and have been charged with offences relating to offensive weapons. 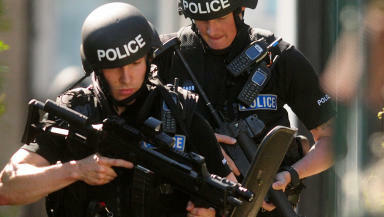 A Police Scotland spokesperson confirmed no shots were fired and the arrests were made as part of an ongoing inquiry. They added: "Three men, who were arrested in Perth Road on Sunday, November 18, have been charged with offences relating to offensive weapons. "Police Scotland can confirm that as a result of this incident there is no threat to the wider community." The men, aged 40, 43 and 46, are due to appear at Dundee Sheriff Court on Tuesday.